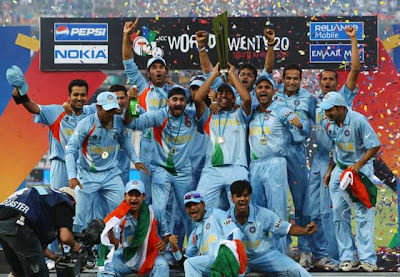 The sequel to the recent movie of 'Chak De India' was created in real life by Team India by beating Pakistan in a thrilling ICC Twenty 20(T20) final. The journey of winners of inaugural T20 world cup has been a absolute fairytale. - March 23rd 2007, India made premature exit from ODI World Cup, after losing to Sri Lanka in a group match. The popularity of cricket went to new lows in India. - July 2007, India's Trinity(Sachin, Saurav & Dravid) opt out of T20 world cup, as the format is suitable for younger players. Then BCCI had to select new captain. After seeing matching saving innings at Lord's Test, selectors decide to give responsibility to M S Dhoni. - India lost closely fought ODI series against England. The preparation for T20 world cup was evident from Robin Uttappa's strokeplay in 6th match of the series. - T20 kicked off, no one had expectations Dhoni's team. - Match 2: Vs Pakistan, a thrilling tie. India emerge victorious through penalty shoot out(bowl out). - Match 3: Vs New Zealand, first match of Super-8. India end up on losing side by not able to cross Vettori hurdle. - Match 4: Vs England, a do or die match. Yuvraj Singh doing Full monty(6 of 6) to Staurt Broad and ultimately was the difference in winning and losing. - Match 5: Vs South Africa, another do or die match. India held their nerves to crush Proteas on their home soil. - Semi Final: Vs Australia. Yuvraj came to party again and disciplined bowling in last overs did the trick. ODI world champs knocked out. - Final: Vs Pakistan. the build for this match was superb and was a described as mother of all contest. It turned out exactly the same. India lifted the trophy by defeating their arch rivals by 5 runs. Got to feel for Misbah ul Haq. He had almost won the match of Pakistan, his fate was similar to that of Lance Klusener in 1999 ODI World Cup. His attempted scoop over fine leg, seemed initially like a winning shot for TV viewers. Ultimately ball landed in safe hands of Sreesanth and match over. India ne T20 world cup ko Chak Diya!!! Kudos to Team India and especially to captain Dhoni for making right tactical decisions at right time. It's shame there had to be a loser after this thrilling game. But, the game of Cricket is the ultimate winner. I believe T20 format will globalise the game of cricket. 'Minnows' word will be eliminated from ICC's cricket dictionary. T20 format will bring non Commonwealth sporting nations such as USA, China, Korea to main league of cricket. M. S. Dhoni joined Kapil Dev to form the league of Indian world cup winning team captains. well, both of are not from big cities(Mumbai, Bangalore, Hyderabad). Simon Taufel(Australia) one of the best umpire of current era got the first chance to umpire in a world cup final. He was denied a chance as Team Australia was playing each and every final in recent times. 'Chak De India' song is going to be sports anthem of India. It really raises one's energy levels. The phrase is used in all form of media to report victory of Team India. As advent of T20 format 'slog overs' will no longer be most recently used words in Cricket. Every second counts and every moment is a highlight. A cricket world cup final on Monday at 5.30 pm IST. not in tune with India cricket viewers. Well, who would have expected India & Pakistan to be in final. Actually, the timings were in tune with Australian cricket viewers, as their Team was most favorite to enter finals. As Gavaskar said 'the best dot ball is the wicket ball' is valid for T20 format as well, and India won the thrilling match by bowling 10 best dot balls. It's not a game loaded in favour of batsmen, as reiterated by many naysayers before the start of tournament. - Sambit Bal: Oh Misbah, not again. - Indiatimes: Twenty20 will become huge in India, says Dhoni. man ... what a match !!!!! no one can ever dreamt or even a big director cannot script such a match . Better than India vs Australia. I am going to savour these moments for my life . My heart was in my mouth when misbah scooped that ball over fine leg. amazing end to amazing t20 and amazing blog to sum that up. For the first time getting up 5 am and going to office at 10 has worked for me. i must agree with u, if cricket becomes global sport, India's survival will be difficult. at present we are champions in the game which is hardly played at professional level in a dozen of countries. anyway we will remembered as first T20 champions :) as people still remember West Indies as first ODI champions and Uruguay as first Soccer World Champs.